Description: These engines are assigned to the Memphis and Jackson locals. The Grenada Switcher is fixing to use them to make up the Jackson Local. Description: 41T rolls 47 cars west along the frozen Susquehanna west of Campville. Description: After many years of dithering about where to locate the bridge, NYSDOT finally decided to site a Susquehanna crossing at exit 66 on NY 17, the Apalachin exit. This turned out to be a good thing for me, as it eliminated the need for me to have to go through Endicott most of the time, and also provided a good place to get a shot of a westbound, such as this 41T rolling toward Owego. Description: 41T rolls around the big curve at MP 231 in the snow. Description: 41T gets 47 cars underway from Binghamton, crossing the frozen Chenango River. 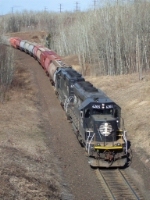 41T typically got a set of CNs new SD75s or GEs, or some combination of them. Occasionally an older unit would get in the mix, as well as IC units. Here we see one such mixed set. Description: 41T rolls out of a stand of trees that flank the tracks near MP 233, passing the eastbound signal as it crosses Hiawatha Rd. Description: GCFX 6048 & IC 6204 lead a train south on the Single Track of the CN Memphis Sub. Description: IC 6204 does some switching in the UP Salem yard. Description: Turning north at Santa Fe Jct... this train narrowly missed hitting a garbage truck right in front of me! Description: 2 IC sd40-3's lead a welded railtrain and a ballest train south. Description: Even better then the power on the head end was the pair of IC helpers! It was great to hear two SD40-3s in run eight giving it all they had to shove the train up grade. The bass and sound that these units made reminded me of the good old days when the WC Transfer would grind up Shoreham Hill. Description: A mixed freight came out of Pokey, and shortly afterwords a helper set came on to the rear end to help give it a shove up Steelton Hill. Sure is nice to see a pair of black ICs in 2010! Description: The Proctor Switch job heading back up grade with some nice power, and what appears to be a recently repainted CN SD40-2W. Description: The last unit on the Proctor Switch was the DM&IR 409. While it wears CN paint now, it was still nice to see a DM&IR unit working on home rails. Description: Second unit out on the Proctor Switch as it heads back up grade. Sure was nice to see a black IC SD40-3 in 2010. Description: This Illinois Central SD40-3 rebuild gets a quick running inspection just prior to entering one of the Shops Yard operating power buildings before heading back out onto the road agin. Description: IC 6204 and CN 5785 head light back to the enginehouse for servicing.